I recently found a really cool book called XOC by Matt Dembicki. It’s about a female great white shark traveling across the ocean to have her children. Don’t get me wrong, I hate sharks! They’re so freaky, but the book is really well written. The story starts with a large mass of sharks attacking a herd of seals. 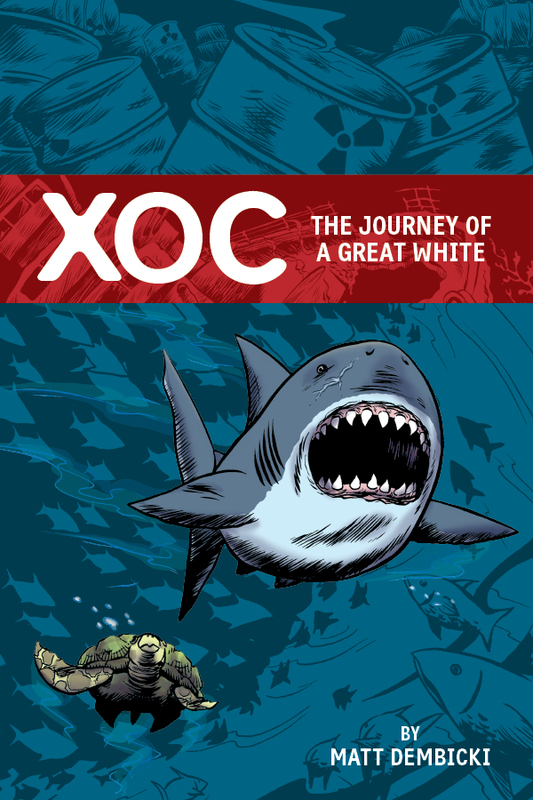 XOC is one of those sharks. After the hunting, she leaves to go across the Atlantic The first thing she sees is two people in a shark cage. She bites the cage to get a better idea of what it is. She fails to break the cage and leaves. Much later she is swimming along when an unwanted visitor comes to see her. Two orcas body slam XOC. She tries to attack but is disoriented and is slammed again. She desperately swims to the surface and thrashes around in the waves until the orcas leave. Soon after the painful experience, XOC befriends a sea turtle. It has one flipper. It said a surface dweller clipped it. On their travels, they come across two age old enemies locked in combat. A sperm whale and a giant squid are fighting. The giant squid tries to cover the whale’s blowhole to drown it, but before the squid can reach it, the behemoth whale crushes the invertebrate in its jaws. XOK leaves so as not to attract notice. 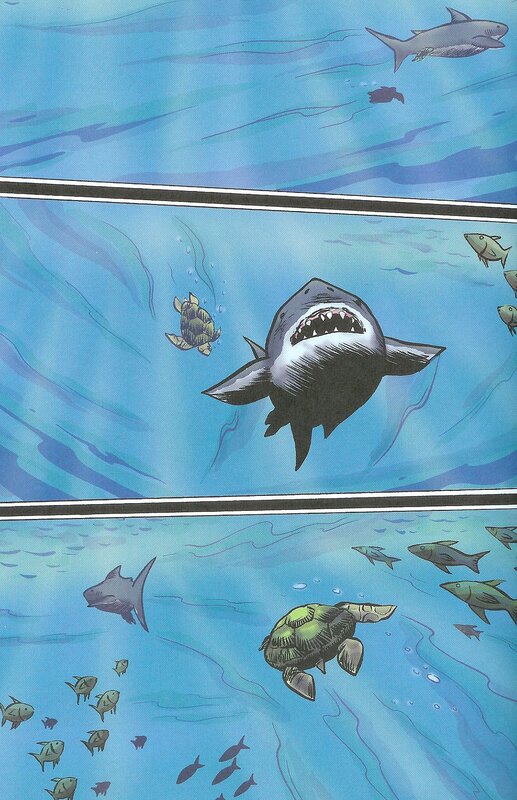 The shark and turtle continue moving and seeing things until the end of the book. I just gave you a taste. One thing I really like about XOC is that XOC never becomes a cute Disney animal. She stays as a horrific creature of the sea the whole time. If she was nice, the book wouldn’t make any sense. What makes this book cool is that it's from the perspective of a monster. Now, the artwork in this book is amazing. If you ever wanted to see realistic looking but also talking animals outside of a movie, check out XOC. It’s awesome!!!! I think that the reason Matt Dembicki chose to make these creatures talk was to make all the animals characters instead of mute pictures. Just one more thing, XOC is quite new. So it wont be very hard to find. "Don’t get me wrong, I hate sharks!" LOL. Forgive them, for they know not what they do. They are mere bundles of nerves wired solely for survival. They taste pretty good on the grill with a nice mango salsa! Thanks for the recommendation. I am a school librarian--I'll get this for my library! She's pregnant, she's a horror of the deep, AND she befriends a wounded sea turtle. This sounds like one of the great characters of all novelology. I must read it. This is all doubly interesting, given the fact that the waters off Wellfleet have recently become INFESTED with great whites. Thank you for the review. I enjoyed the sentence, "XOK leaves so as not to attract notice. " If I saw a whale and a giant squid locked in battle, I would flee in panic. I nearly did just reading it! But I can see how a savvy shark, a born killer, would simply slip away so as not to attract notice. I also enjoyed the use of the word "behemoth." It's a great word, and we don't get to use it often since there aren't many times we speak of creatures so large. Another fun word that describes something enormous is "juggernaut." I look forward to the next review. I want to thank you so much for running this blog. You are a great resource for me, because I have a 10-year-old son who likes the same things you do. Last night I ordered him Big Bad Ironclad and XOC for Christmas presents. Keep up the good work!! I've been wondering about this book. Thanks for the review. It looks fascinating. I agree, I like the realistic/natural illustrations too.